French President Emmanuel Macron promised Tuesday to rebuild Notre Dame Cathedral "within five years" after a fire caused extensive damage to the Parisian landmark. Macron said in a nationwide televised address the 850-year-old structure would be rebuilt "even more beautifully" and called on citizens to "change this disaster into an opportunity to come together." The fire is out and experts are assessing the damage. Paris fire department spokesman Gabriel Plus said building specialists and architects are "surveying the movement of structures and extinguishing smoldering residues." The flames, which at one point burned 10 meters into the air above the roof, destroyed much of the cathedral's roof and caused its central spire to collapse. 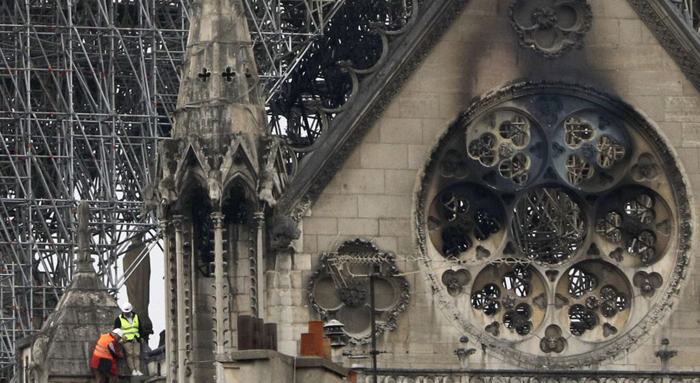 Paris officials said firefighters worked to save as much art work and holy objects from the 12th-century cathedral as they could. Paris Deputy Mayor Emmanuel Gregoire said pieces of the purported Crown of Christ was salvaged and transported to "a secret" location. Paris prosecutor Remy Heitz said 50 investigators are involved in the "long and complex" effort to find the cause. Heitz said investigators would interview workers from five companies working on the restoration. A spokesman for one of the companies, Julien le Bras, said "all the security measures were respected" by its 12 workers who he said are "participating in the investigation with no hesitation." A Vatican statement expressing shock and sadness and called Notre Dame a "symbol of Christianity in France and in the world." Vatican spokesman Alessandro Gisotti said Tuesday on Twitter Pope Francis is praying "for those who are trying to cope with this dramatic situation."